Melissa has completed a certificate in veterinary assisting and has a bachelor's degree in biology. 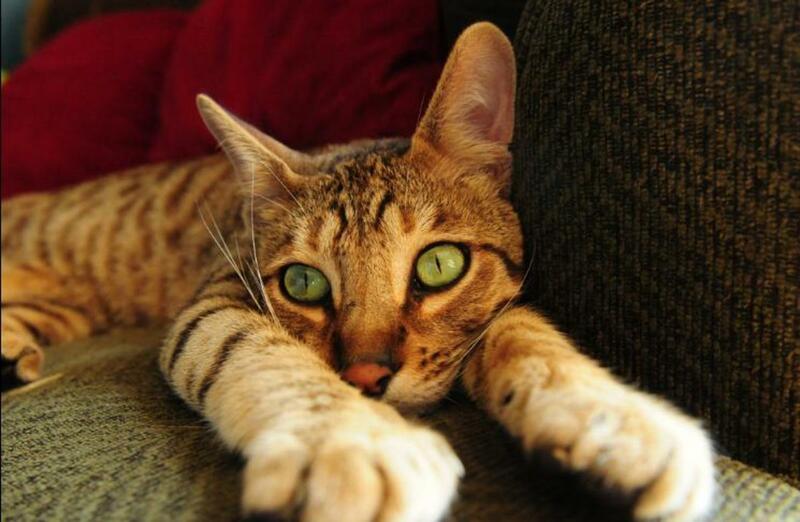 There are many reasons why people might seek short-lived pets. There are a surprisingly small number of pets that have around a 5-year life expectancy, but such a trait is in high demand from first-time pet owners who aren’t interested in making a vast long-term commitment or parents seeking a temporary source of enrichment for children. Short-lived pets can also be used as starter animals for kids hoping to prove themselves by providing exemplary care in order to acquire higher maintenance animals like dogs in the future. As long as the animal is provided for, there is nothing inherently wrong with seeking animals for the above purposes. Most animals can live surprisingly long lives with good care. It is common for many species of parrots and tortoises to outlive their owners with a lifespan of 50+ years, so opting for animals with limited longevity is not only beneficial, but essential for owners who cannot make big commitments, such as if they will eventually depart for college but still want the experience of a pet while waiting. 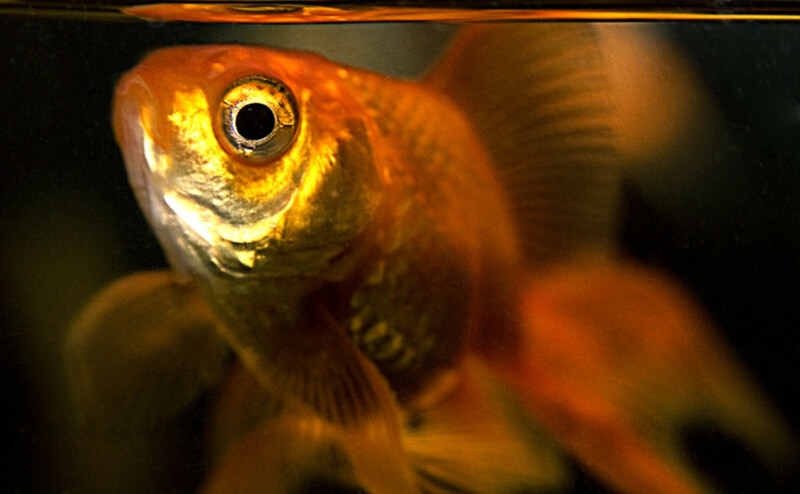 However, you should beware of the unfortunate misconceptions that many people have about certain animals, such as goldfish. They do not have short life spans, but instead are often poorly cared for and die prematurely. This is probably one of America’s most popular small pets. Unfortunately, they are bought too often for small children with suspect suitability. 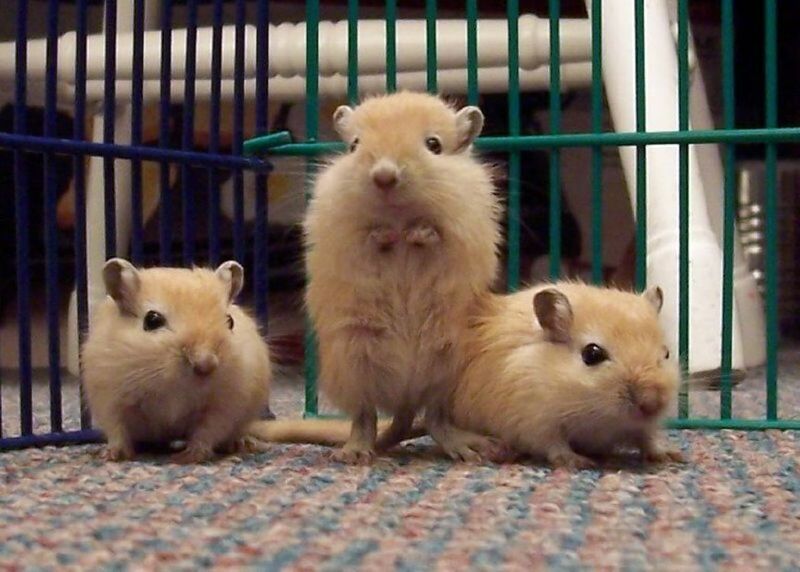 Hamsters are generally very short-lived animals with a lifespan that doesn’t exceed four years. 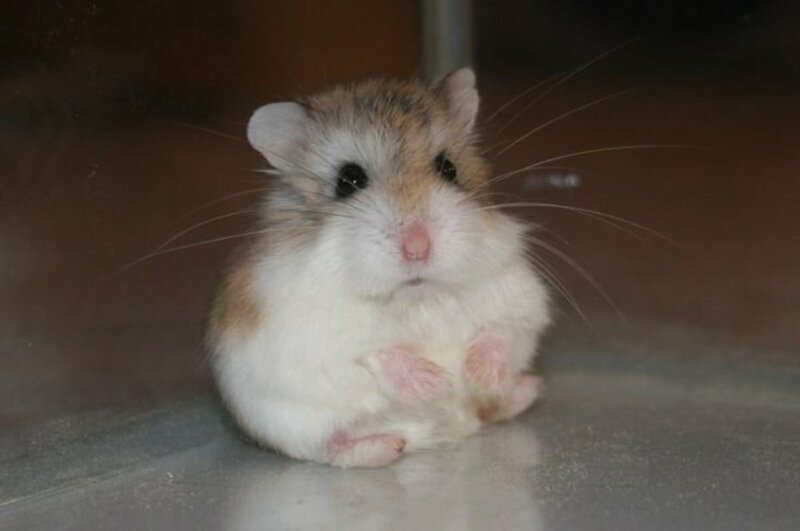 Hamster longevity varies by species, but on average, three years is what most well-cared for hamsters can hope to achieve. All hamsters are nocturnal, so while they are popular pets to buy for small children, they may become irritable from excessive handling during their sleep time hours. They make a lot of noise at night, which can be counteracted with silent spinners. Well-cared for + luck: 5 years. Max age reported: 7 years. Provide a large cage: Even for dwarfs, it is common for pet dealers to sell cages that are under the recommended size for the active rodents. Remember that in the wild, hamsters are highly active animals that can cover miles in one night. While an exercise wheel satisfies most of this, hamsters shouldn't be kept in cramp conditions, like what is provided by the standard CritterTrail cage. Some owners have made simple cages out of Ikea shelves. 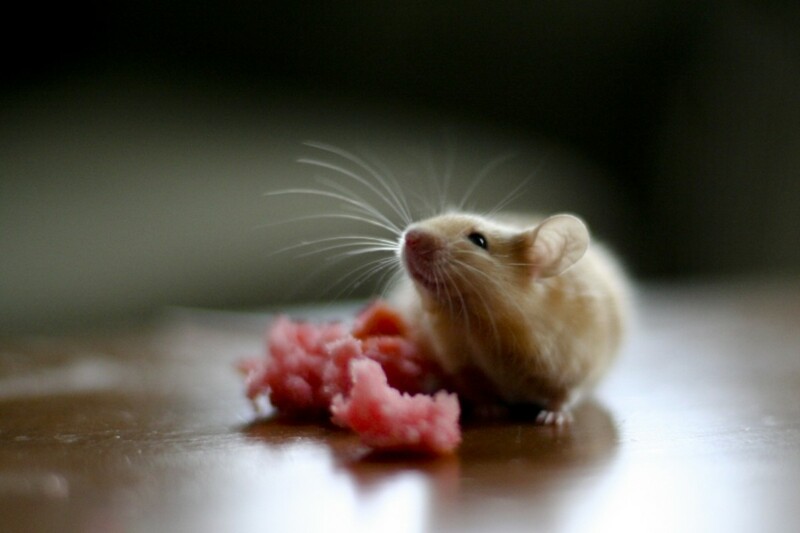 Feed a varied diet: Remember that dwarf hamsters are prone to diabetes, so they require diets low in sugar. One commercial diet that is recommended as the base is Hazel Hamsters. Good vegetables to give it include broccoli, carrots, and turnips. Create a complex environment: Add ramps, levels, tunnels, and anything else that keeps the enclosure from being a barren square. 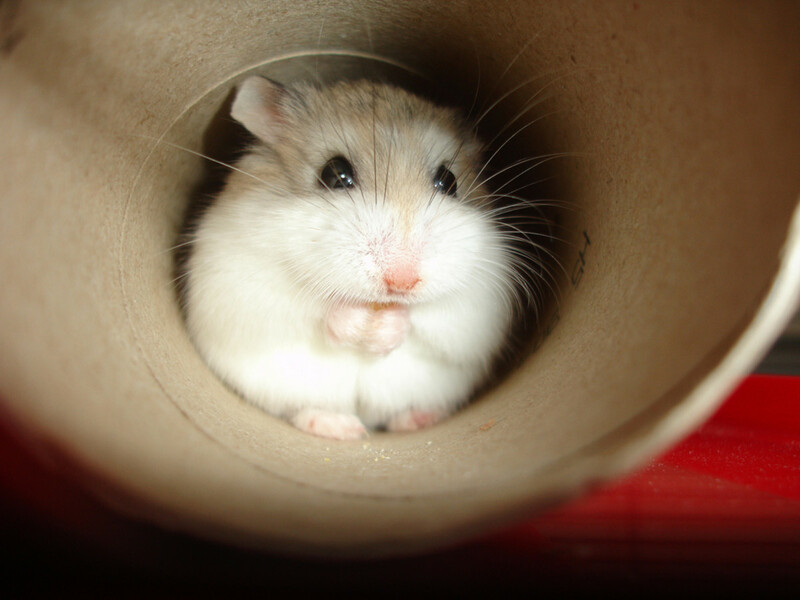 Hamsters love to tunnel, so material supporting this is essential. Also consider the many enrichment choices offered in pet stores. You can include attachments to your pet's cage. Multiple chewing toys are also a must, and occasional treats help to keep things interesting. You can read more about ideal housing here. Go on Youtube: Search through the numerous videos addressing hamster products, hamster care, and creative ideas to make the pet experience more interesting for both the hamster and owner. Be sure to research beyond this article as well. Syrian Hamster: 2 - 2.5 years. Campbell Dwarf Hamster: 1.5 - 2 years. Winter White Dwarf Hamster: 1.5 - 2 years. Roborovskii Dwarf Hamster: 3 years (2 years in the wild, longest lived). Chinese Dwarf Hamster: 1-1/2 to 2 years. 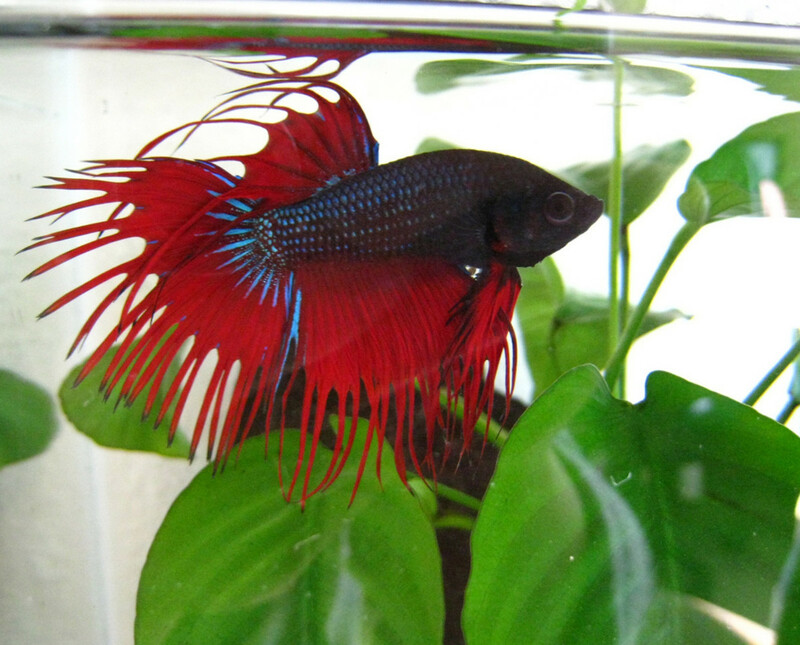 Bettas are extremely popular fish that are often kept in horrendous conditions within chain pet stores and Walmarts. On average, it is likely that they don't survive a few months in captivity. With the proper care, they can live around three years. Some individuals can exceed this number. Max age reported: 9 years. Tank size: Do not keep these fish in the small bowls that they are typically sold and marketed in. Planted jars are also completely unsuitable for them. Bettas might survive in this size for a short period of time, but that is not an optimal quality of life for these fish. They should be housed in at least a two gallon aquarium, but at least five gallons is ideal. Feed it proper fish food: Frozen blood worms, daphnia, and brine shrimp are recommended. Water quality: The quality of the water is the main reason fish die in captivity, so proper filtration and water changes must be carried out. This is more imperative for the small tanks that bettas are generally kept in. It is recommended to change out the water twice a week. Temperature must be adequate and maintained as well. They prefer warmer water, so a temperature around 74 degrees is recommended. Another widely popular small pet is the guinea pig. These animals make good pets for people unsure about their long-term pet keeping abilities and for young children, provided they are willing to clean cages at least every other day. They require a simple diet and enclosure. These animals generally live for five years, but it is not uncommon for well-cared for individuals to exceed this number. If you must have an animal that won't be around after five years, this isn't the animal for you. 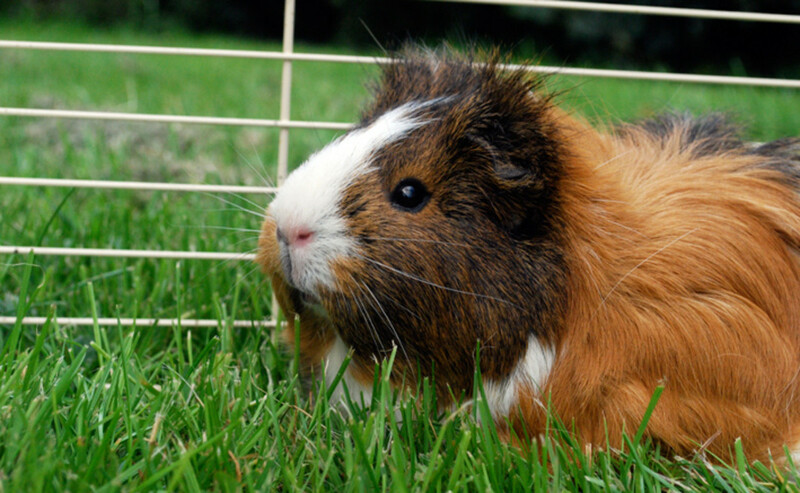 It has been reported that long-haired varieties of guinea pigs have shorter lives. Well-cared for + luck: 5-8 years. Max age reported: 14 years. Feed it a healthy diet: As with all animals, guinea pigs will generally live longer if consideration is given to what they eat. Guinea pigs should have a high quality pelleted diet as well as Timothy hay or orchard grass (not alfalfa hay). The diet should contain or be supplemented with vitamin C in the form of oranges, kiwi, parsley beet greens, and other sources. You can check out this comprehensive guide for more nutrition info. Guinea pigs are social: It might help to have more than one animal. Be sure to pair animals properly according to gender and the personality of the individual. Males fight sometimes, so monitor the situation and be aware. They should also consistently have some cuddle time with their owners. Caging should be appropriately sized: C&C cages are popular choices that provide ample room and are the easiest to clean. Many owners add attractive ledges that lead to secondary levels for even more exploration room. You can use this guide to get an idea of how big your cage should be. There are two species of commonly kept chameleons that have expected lifespans of five years and under; the panther chameleon and the veiled chameleon. Female panther chameleons have an even shorter lifespan (three years) if they are used as breeders (most owners buy males for their colors). These animals require advanced care in comparison to the other animals on this list. They are specialized lizards that are prone to stress. Unfortunately for chameleons, they live a high stress life which eventually takes a toll on them. In the wild, their lifespans are reduced to around three years for males and two for females. Well-cared for + luck: 6-8 years. Max age reported: Claims of 13 years for veiled and around 8 years for panther. Make preparations: Research these animals thoroughly before considering them. Also be sure to set up their cage in advance before bringing the animal home. They are not inexpensive, depending on how much you're willing to spend for a short-lived pet ($200-$400 range). Diet: Chameleons require a varied diet of insects. This includes crickets, mealworms, wax moths, and roaches. 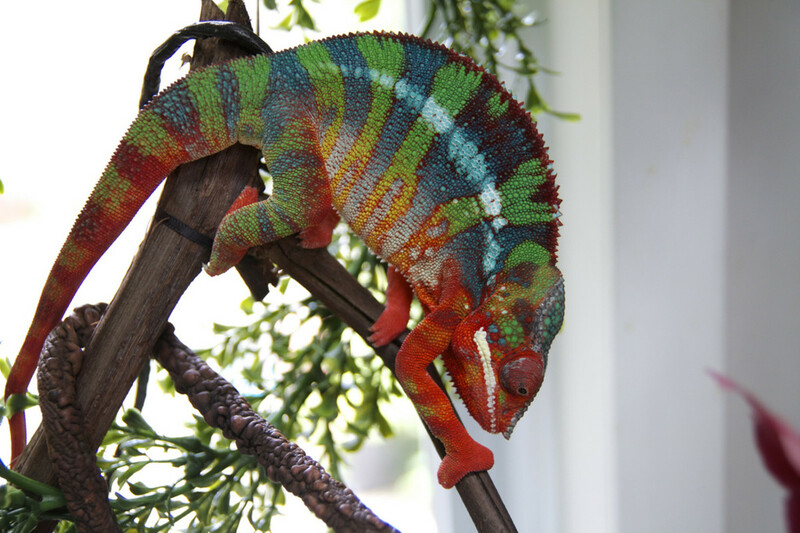 Vet care: Visits to a veterinarian are recommended since chameleons are prone to developing metabolic bone disease. Get a proper living environment: Babies require smaller housing before being moved to a specialized tall and vertical screen cage around four feet tall and two feet wide. Other aspects of husbandry that require research includes lighting (they need exposure to UVA rays), humidity, live plants (for climbing), and potential health problems. It's not really a shocker that mice are short-lived, being small and high-strung. If you want a temporary pet, mice seem to fit the bill. There are no worries about the possibility that they might live past three years since this is extremely rare. There are many varieties of mice, but for the most part, they will not live longer than a mere two years. Non-domesticated mice might live longer, possibly up to five years. Many strains of domesticated mice are prone to health conditions such as tumors and immune deficiencies. Mice are the model organism of choice used by scientists to explore these conditions in the laboratory, so there is a wealth of longevity studies that mouse keepers can explore. As with the other species on this list, diet, stress reduction, and a healthy environment are paramount to reaching a three-year lifespan for your pet mouse. Mice, like other small rodents, are very active, so do not underestimate how much size their enclosure needs. You can check out this guide for more info on caring for a mouse. Well-cared for + luck: 3 years. Housing: Multi-level housing is recommended since mice like to climb. A wire cage works best. Aspen shavings works as good bedding. Diet: Pellets are readily available at pet stores. You could supplement this with small amounts of fruits and vegetables. Watch for swelling: Tumors are fairly common in mice. Unfortunately, they are often malignant. Most tumors can be surgically removed, but they often come back. The second most popular model organism in research are rats, and they too have plenty of longevity committed to them. Rats possess an unappreciated intelligence and do make wonderful pets. 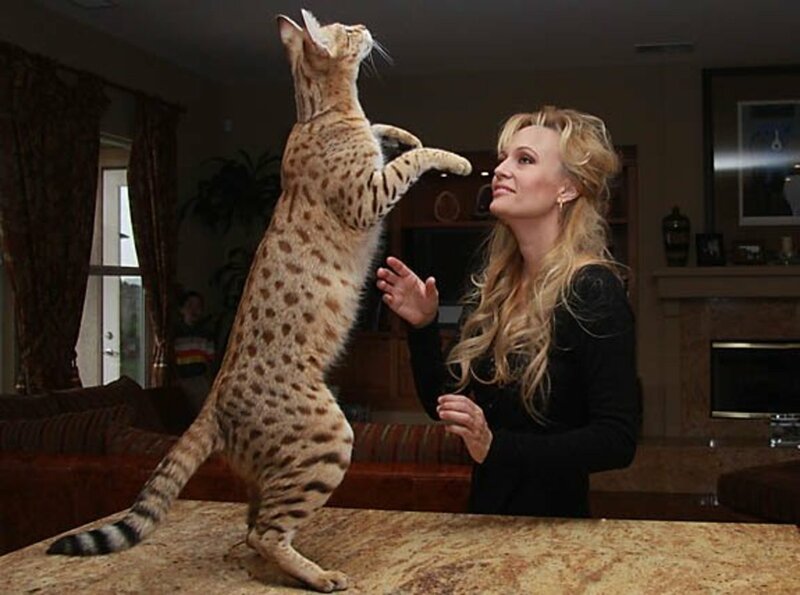 They form emotional bonds with their owners and are quite playful. They can even be trained to use a litter box and perform tricks. Do not short them out on the best care just because of their unfair reputation. Rat longevity is improved mainly by genetics, but quality of life and nutrition also play important roles. Well-cared for + luck: 4 years. Max age reported: 7 years and 4 months. 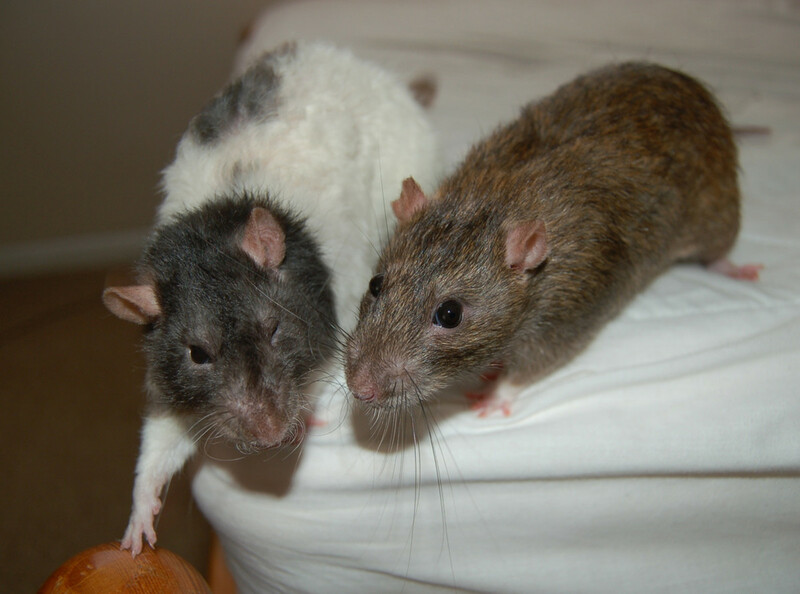 They are social: You may consider getting a pair of rats. They are very social animals and do better if they have a buddy. Two males will get along if they are litter mates or were introduced at a young age. You shouldn't get a male and female together unless you want a lot of rats very quickly. Diet: Ready-made pellets are available. You can also give them some fruits, vegetables, and mealworms. Exercise: Rats needs a considerable amount of exercise. Large cages and a wheel are recommended. 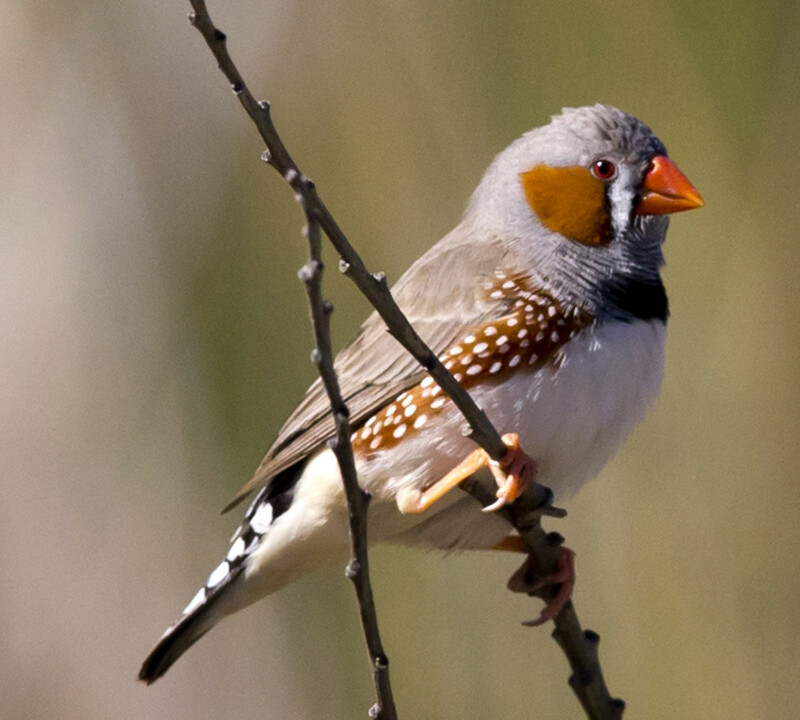 Zebra finches are the shortest-lived bird species that are commonly kept as pets. They barely make this list as their minimum expected lifespan with good care starts at five years. They could live as long as 10 years. 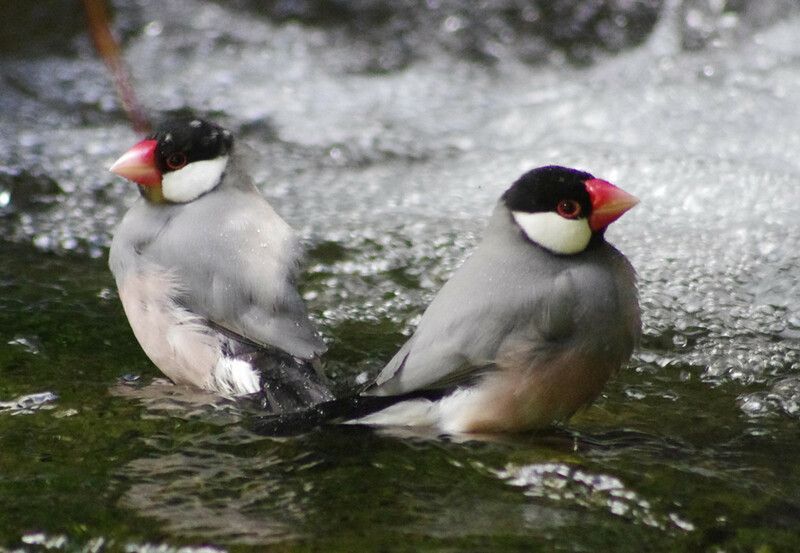 It is possible that these small birds can live even longer. They are generally low-maintenance pets as they feed on seeds (other birds, such as cockatiels, should not be fed diets like this). These birds are not interactive pets, so their permanent caging must allow for plenty of flight room so the birds can get exercise. There should be one pair per cage. Max age reported: 12 years. Cage dimensions: These birds prefer to move horizontally, so their cage should ideally be longer. A tall cage is not vital. 30 inches long and 18 inches high is a good size. Be sure to include swings and ladders. Where to place them: These birds will do well in a quiet corner in your home. Avoid placing them in direct sunlight or near AC. They don't crave social interaction, so an isolated corner will do well. Diet: A good quality seed mix and some greens will be the ideal feed. Romaine lettuce, kale, and spinach is ideal. 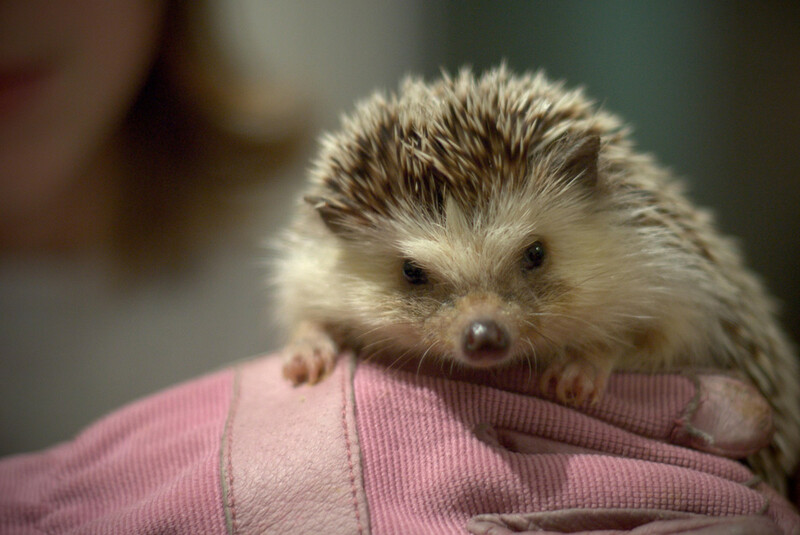 Despite their appearance, hedgehogs are not rodents. They are also not related to porcupines. 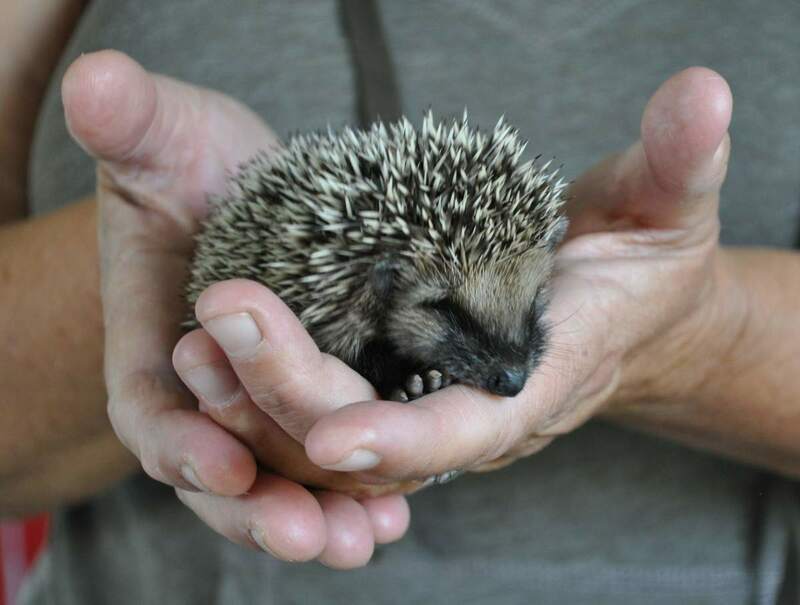 The white and grey species that are normally seen in the pet trade are referred to as African pygmy hedgehogs, and they are actually hybrids. Despite extensive breeding in captivity, this species maintains strong similarities with their wild cousins. This should be taken into consideration when deciding on an enclosure, methods of handling, and exercise requirements. Cancer is a common cause of death in older hedgehogs. 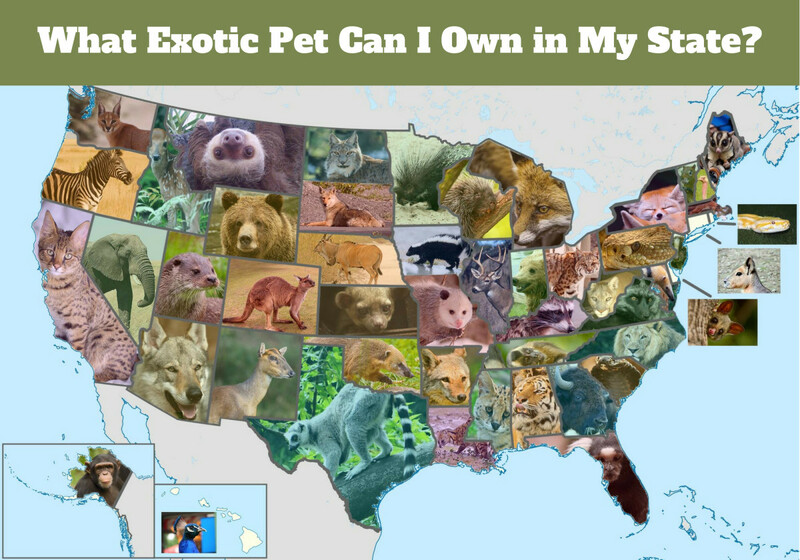 Keep in mind that some states ban owning hedgehogs, so check your local laws if you are interested in having one as a pet. Well-cared for + luck: 6-10 years. Max age reported: 10 years. 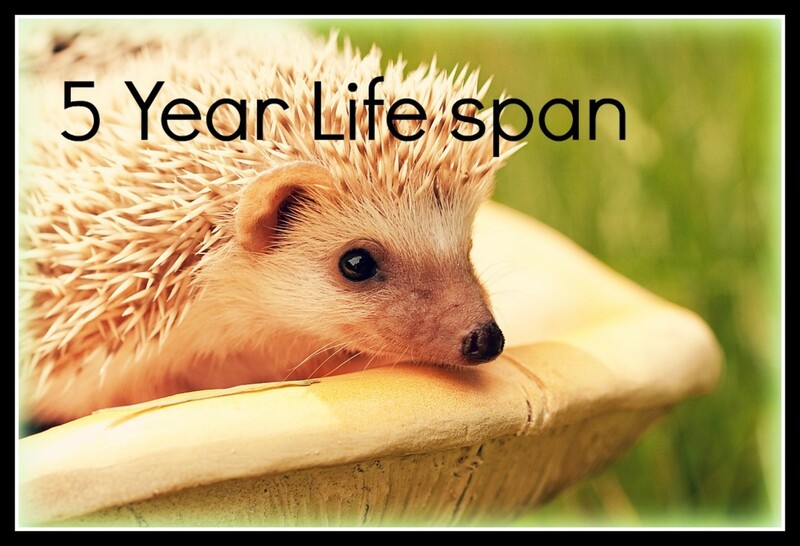 Exercise: Weight gain due to lack of exercise can shorten a hedgehog's lifespan and promote fatty liver disease. A means of exercise must be provided, and the cage must be large. Not all hedgehogs will use hamster wheels. Here is some great info on housing recommendations. Stress: Do not handle often, and when handling, be gentle and aware of the stress this might cause. Diet: Feed the hedgehog a balanced diet to promote longevity. Food can include fruit, insects, cooked meats, and vegetables. Commercial hedgehog food is available. These animals look like rodents, but they are actually marsupials like kangaroos. They possess a prehensile tail. These solitary animals are insectivorous, but in captivity they eat prepared foods supplemented with various animal protein sources. Their dispositions vary as they require a patient owner that can tame them down. They can exercise with a correctly-sized hamster wheel. Well-cared for + luck: 5-6 years. Max age reported: 8 years. Legality: These animals are considered exotic pets, so be sure to check your local laws before looking into owning one of these animals. Housing: A secure enclosure is strongly recommended as these animals are quite good at escaping. A wire cage may work best. Corncob sheddings is an ideal bedding. Their cage should have some type of perch for them to climb. Diet: Manufactured feed is now available for these animals. You could also give it mealworms, fruits, and vegetables. As one would guess, this is a very uncommon pet. It's not for beginners to marine invertebrates. By the time most octopuses reach adulthood (which is when people keep them as pets), they have, at best, a year left to live. Unfortunately, despite the considerable effort one must make to successfully care for them, they are short-lived creatures. However, they are perfect for the adventurous, advanced aquarium enthusiast that doesn't want to make a long-term commitment. Octopuses are famous for being intelligent. They require escape-proof tanks. Average: 6 months to 5 years, depending on the species. Well-cared for + luck: 2-5 years. Be knowledgeable: Different species have different needs. They grow to different sizes and each species needs different water temperatures. 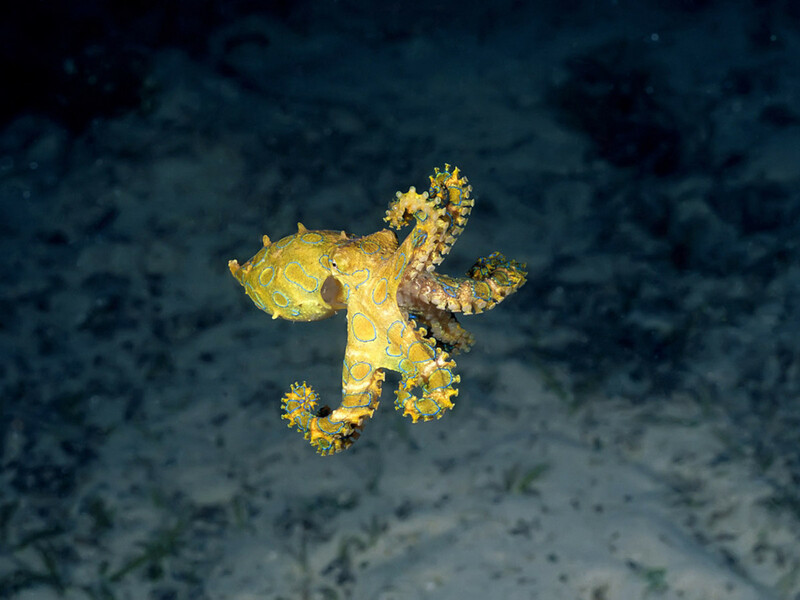 The California two-spot octopus is the most common species held as a pet. Tank size: The ideal tank size for a California two-spot octopus is 50 gallons minimum. Bigger is always better and it may be a necessity for larger species. The tank should have lots of hiding places and caves. Diet: Octopuses are hunters. Many owners report that they prefer to be given live food. Their food can include crabs, shrimps, snails, and small fish. Just like with rats, mice, and hedgehogs, longevity with gerbils depends on genetics and quality of care. Gerbils require similar environments to hamsters, but they are primarily diurnal, meaning they will synch better with your schedule. Here is great guide for tips on caring for a gerbil. Housing: House gerbils in at least a 20 gallon aquarium with plenty of the recommended bedding. They love to burrow and tunnel, so provide inches of the material. Diet: Feed them a premium gerbil food and supplement them with fresh vegetables. Daily care: Handle carefully and make sure they get plenty of exercise. Here is a list of pets that live longer than what most people think. I have 2 bettas that are 10. They do not have short life spans if you take care of them properly. Great article! Had a lot of great information in a very easy and fun to read layout. One of my ginuea piggys lived till it was about 4. The other one lived till it was almost 10. 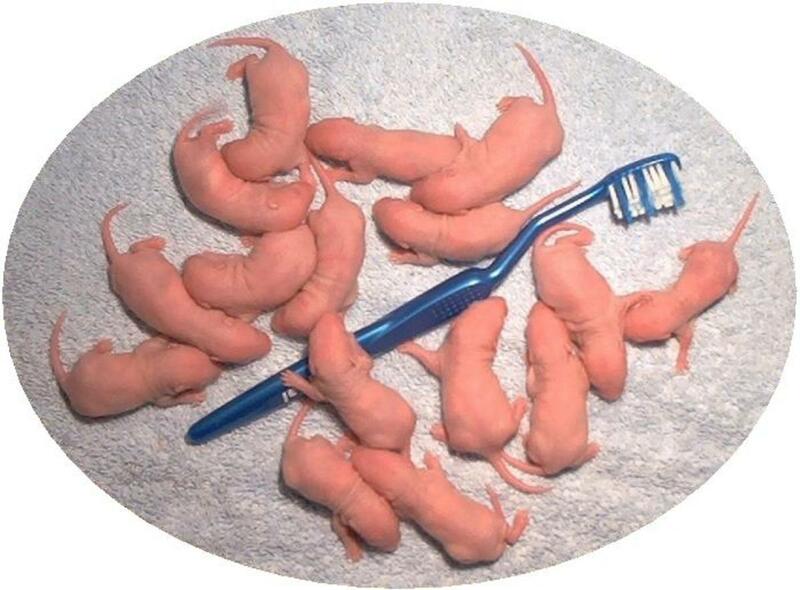 We've had 4 pet rats, and my sisters also had many. They actually seem o only live about 2 years. We all had females, they almost all got mammary or brain cancers by about 2, one had to be put down she was in so much pain. Basically, they make absolutely lovely pets, they're smart, friendly ect. but not for the faint of heart. Towards the end of their lives you can be dealing with blood, tumours, and near constant care... it's quite upsetting, so I definitly wouldn't reccomend them for kids who might not understand or know how to deal with such specific issues in older age or get upset easily. Great article, full of good information. My daughter is a sophomore in high school, and wants a pet, so short lifespan will be ideal for us. Dez that's an excellent suggestion, wish I thought of that. Also excellent advice! Older pets need great homes too. Yes they can, and live albino rats can be used for food everywhere by Anchorage itself. There really aren't any wild or feral populations of reptiles other than turtles. Not only does the cold winter get to them, but the fact that there is very little sunlight during the winter months also causes problems for their survival. But now this begs the question - can frozen rats still be shipped and used as reptile food in Alaska? Breck123-- Now that's funny. Large snakes are legal, but their FOOD isn't. Good, maybe that will make people unable to feed rats live. On a more serious note, those reptiles would never survive a New York winter, so they certainly wouldn't last in an Alaskan winter, but I don't think domesticated rats would either. Just checked Alaska's regulations on exotics. Your right, rats are banned! Yet, they allow large pythons, alligators, and crocodiles..... Now don't get me wrong, I believe that anyone has the right to own whatever they want, but I mean, if your going to allow large reptiles, why ban rats? Wow. Who knew? They do make awesome pets. I'd have to agree, I don't think the docile fancy rat would stand a chance against the wild black rats. Penny Sebring-- My goodness, how silly. Not to try to make light of exotic pets and their relationship with the ecosystem, but if we haven't seen any outbreaks within the continental U.S. with domesticated rats despite IMMENSE popularity as pets, including in the warm regions (Florida, Texas, Louisiana), how do rats have a snowball's chance of proliferating in Alaska? I doubt any domesticated rat would stand a chance against the real invader, Rattus rattus (the black rat). I'm betting you have domesticated cats running around outdoors though, right Penny? This stuff drives me mad. Only albino pet rats are allowed anywhere in Alaska, and no rats at all allowed in Anchorage. The government up here is concerned about them escaping and becoming a danger to the ecosystem. Yes--the cleaning was a real pain--but it was worth it. :-) I think the hamsters really enjoyed all the different rooms. They'd specify places to store their food throughout and every single one loved to sleep in the smallest box that was perched out of the top of the unit. I think it made them feel safe and cozy. Penny Sebring-- Rats are illegal where you are? Wow. Rozalyn Winters-- Yes, I remember the gunk that would get trapped in Habitrail products. We kept a few hamsters in my childhood. My favorites of this group were always the fancy rats. They are so friendly and smart. I enjoyed training them when I lived where I was allowed to have them. If they ever become legal in my town, I'll be one of the first people to bring them home! I agree that you need to be careful about the age you start kids with these critters, not only for care-taking reasons, but also to be sure the child can cope with their shorter life-span. I recall being very upset having coming home from school one day, and finding out that my most favorite pet had passed away. Parents need to handle these situations gently and with care. Keeping small pets is one way to help children learn about the circle of life, especially for city-kids who aren't exposed to farms, etc. Great hub, Melissa! I always wanted a hedgehog because they are so cute. Hello there. wow what an awesome hub. Hi Zookeepers, I don't know, it depends on what you mean by long-lived. Maybe an article about pets that live at least 50+ could be interesting. Nothing comes to mind for the second question, I'll let you know if I think of something! So sad about the guinea pigs! I love them! I remember having hamsters as a kid and being so disappointed when they died. (even though the little buggers would never be tame, which is what I get for buying from petco. Still loved them though.) Since then, I've figured I'd rather take on the commitment and have my pet to enjoy for many years to come, and if nothing too disastrous occurs in the span of my lifetime, hopefully my first ball python will be there to witness all my major life events haha. Anyway, a good article as usual, Melissa. I was unaware that chameleons had such short lifespans; I'd half expect them to live for well over 10 years. For those of us who commit as much as possible to our animals for as long as possible though, do you think it'd be possible to write an article on some long lived pets? That would be wonderful. Also, I've encountered another subject recently I'd like your insight on. I've noticed many animal rights groups claim to be animal welfare organizations when they are anything but advocating for true animal welfare. Do you know of any real animal welfare groups that actually do advocate for responsibly keeping animals, such as pets, livestock, and zoo specimens? It'd be great if you can give me any information on this topic, seeing how there's not much clarity in the ongoing animal rights vs animal welfare debate and with the onslaught of more and more laws popping up every year, it'd be great to get some information on this. Thanks! Thanks grand old lady, you are correct! I didn't know there were so many pets that people could have that live short lives. We had hamsters, but they age so quickly and sadly, they aren't as cute as when they were young. Having a pet that dies young requires a lot of love and commitment, even when they age very quickly. Great hub with lots of interesting and helpful information. Thanks Dr.Mark, the internet is an amazing resource, but it can be a double-edged sword. Gee, I didn't think you were at an age where a tegu could outlive you, based on your photo. jantamaya, great idea, but dogs are so human-like sometimes, losing them can be painful. Hopefully your dog will enjoy many more years, adopting an older dog is a wonderful deed. Beautifully put together article. Nice work. Voted up and interesting. Great article, and well-written! I love your gray bulleted points for lifespan. My eyes went right to them, and it would be easy scrolling for people! I've had a betta fish and a mouse, and I loved having each of them. The fish unfortunately disagreed with my cat. =3 I'm hesitant to get another one, but they're so lovely! I'll probably give in. Interesting topic, since there are people out there who do not want long lived pets. I remember my first Jackson´s Chameleons, and being so disappointed when they died so young. (This was years before all of the great info available on the internet.) I worry that my Tegus will outlive me but am glad they are around for a long time.